Image of the Day: Lights of Alien Civilizations –The New ET Search Beacon? 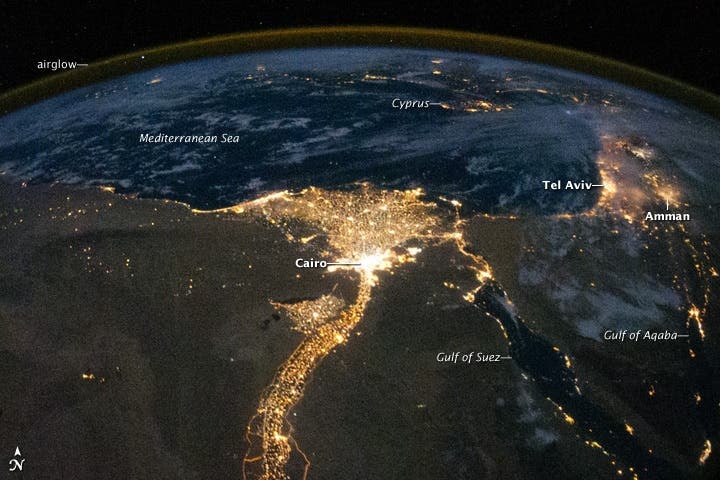 The image above taken from the International Space Station shows the lights of one of Earth's oldest civilizations –Egypt's Cairo and the Nile Delta. If an alien civilization builds brightly-lit cities like those shown above, future generations of telescopes might allow us to detect them. This would offer a new method of searching for extraterrestrial intelligence elsewhere in our Galaxy. In the search for extraterrestrial intelligence, astronomers have hunted for radio signals and ultra-short laser pulses, but Avi Loeb (Harvard-Smithsonian Center for Astrophysics) and Edwin Turner (Princeton University) suggest that we look for their urban lights. "Looking for alien cities would be a long shot, but wouldn't require extra resources. And if we succeed, it would change our perception of our place in the universe," said Loeb. Spotting this tiny signal would require future generations of telescopes. However, the technique could be tested closer to home, using objects at the edge of our solar system. Loeb and Turner calculate that today's best telescopes ought to be able to see the light generated by a Tokyo-sized metropolis at the distance of the Kuiper Belt – the region occupied by Pluto, Eris, and thousands of smaller icy bodies. So if there are any cities out there, we ought to be able to see them now. By looking, astronomers can hone the technique and be ready to apply it when the first Earth-sized worlds are found around distant stars in our galaxy. "It's very unlikely that there are alien cities on the edge of our solar system, but the principle of science is to find a method to check," Turner said. "Before Galileo, it was conventional wisdom that heavier objects fall faster than light objects, but he tested the belief and found they actually fall at the same rate." As our technology has moved from radio and TV broadcasts to cable and fiber optics, we have become less detectable to aliens. If the same is true of extraterrestrial civilizations, then artificial lights might be the best way to spot them from afar.